The review of as many as 700,000 ballots from roughly 500 communities could delay implementation of the law even if the results are not overturned. The recount of votes on Maine’s contentious marijuana legalization initiative began Monday in Augusta with volunteers slowly hand-sorting thousands of “Yes” and “No” ballots, one by one. Volunteer counters occasionally set aside small numbers of ballots that could be challenged because they had been mismarked or may not have been counted properly. On one ballot, for example, a voter filled in the “o” in the word “No” instead of filling in the oval next to it. On another, a voter colored in circles above “Yes” but didn’t fill in the oval. The painstaking recount got underway just over one month before the historic new law is set to take effect. The process of reviewing as many as 700,000 ballots from roughly 500 communities could delay implementation of the law even if the review does not uncover enough counting errors to overturn the results. The law – scheduled to take effect by Jan. 7 – would make Maine one of eight states to allow adults 21 and older to use marijuana as a recreational drug. The legalization votes in Maine and other states in November were seen by advocates as tipping the balance toward nationwide legalization, although uncertainty about the policies of the incoming Trump administration is chilling the enthusiasm. Maine’s law, if it stands, would go a step farther than those in other states by also allowing state-licensed marijuana clubs where people could smoke the drug in a social setting and not just in the privacy of their homes. Social clubs and marijuana stores probably would not open in Maine until January 2018 because the state would need time to set up rules and licensing standards. 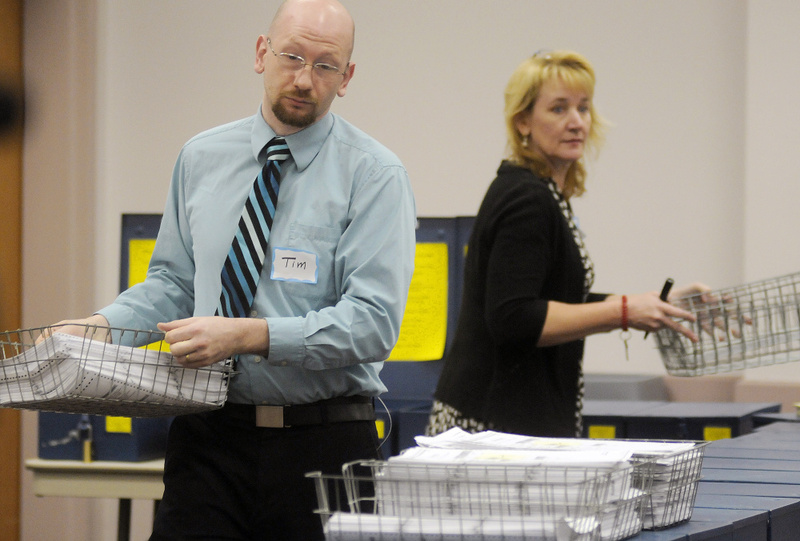 The marijuana recount started at 9 a.m. in the Florian Room of the Maine Department of Public Safety in Augusta. The first ballots to be recounted were from Portland, where residents in initial tabulations voted 24,594 to 13,008 in favor of Question 1. Eighteen volunteers recruited by the Yes and No campaigns and staff from the Secretary of State’s Office formed counting teams. Each volunteer counted the votes, and the totals were then compared. 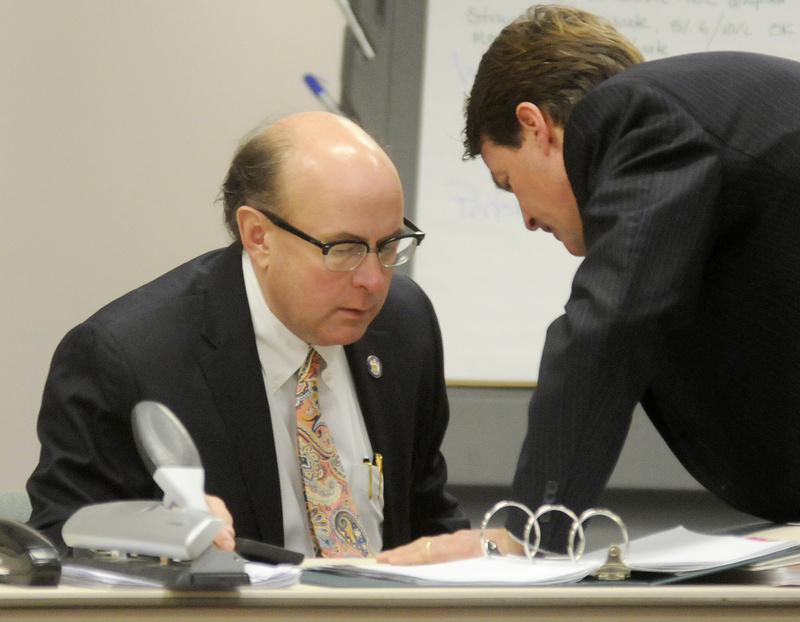 Each side had representatives keeping track of the results, as did the state’s elections staff. Attorneys and campaign staff from both sides watched over the final tallies and kept an eye on any disputed ballots or changes. Fewer than 10 people watched from the audience Monday. 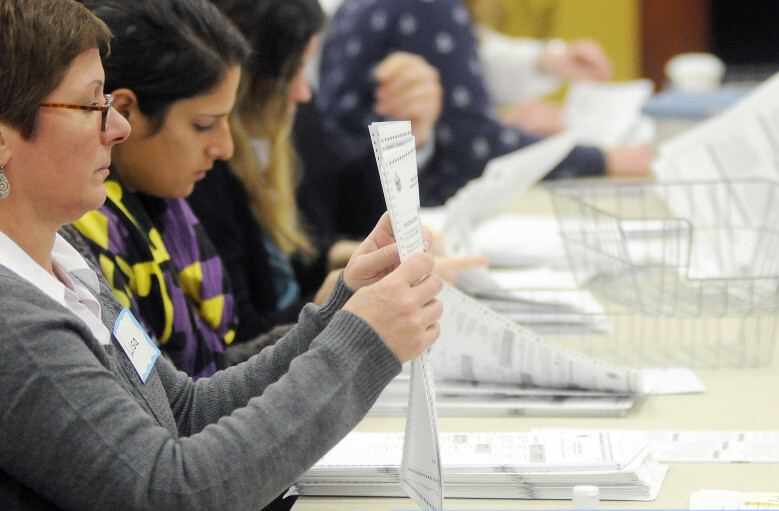 As of noon, the volunteer counters had gone through 11,430 ballots from Portland, or about 31 percent of its votes. It was not immediately clear if any votes had shifted on either side. The Secretary of State’s Office does not release those counts until the end of the recount process. The rare statewide recount of the marijuana vote could take more than a month and cost $500,000, if it continues until all votes are counted. The state is collecting ballots first from larger communities and waiting to see how the recount progresses before gathering ballots from hundreds of smaller communities, a process that will require significant overtime for Maine State Police troopers. Newell Augur, the attorney representing the No on 1 campaign, said opponents will continually assess where they stand in the recount. “We are not going to drag this out if it’s obvious the numbers aren’t moving,” Augur said. Alysia Melnick from the Yes on 1 campaign said legalization supporters want to get the recount completed so the law can go into effect as soon as possible. Melnick said the recount could ultimately delay the effective date of the new law well beyond early January. The recount also will reduce the amount of time that the Legislature has to develop and fine-tune the law, as it is mandated to do within nine months of the vote, she said. Opponents did not have to pay for the recount because the margin was so small, less than 1 percent of votes cast. Question 1 on the Nov. 8 passed by 4,073 votes – 381,692 to 377,619 – according to unofficial results from the Secretary of State’s Office. Opponents say that with such a slim vote margin and given the seriousness of the new law, it’s important to make sure the results are accurate, while supporters have argued it is a waste of state resources. Opponents of Question 2, which imposes a tax surcharge on high-income households and passed by a margin of fewer than 10,000 votes, had also petitioned for a recount, but withdrew the request last week. A large part of cost for the marijuana recount is for state police to pick up padlocked and sealed ballot boxes from 503 individual towns and deliver them to Augusta, according to state officials. State police estimate it costs about $70,000 to collect ballots from 100 towns, or more than $350,000 for all of them. Secretary of State Matt Dunlap said there are additional costs to his office, primarily in overtime for employees who are being pulled away from their regular work. The recount is expected to go on every day for two weeks before breaking for the holidays. If the No on 1 side wants to continue with the recount it likely would begin again in January and push back the effective date of the law. Legalization advocates in Maine and other states saw last month’s votes for legalization in four states as a sign of momentum behind national reform, but are now concerned about potential opposition from the incoming administration of President-elect Donald Trump. Also, Gov. Paul LePage has said he might challenge the vote in court because marijuana remains illegal under federal law. In addition, individual communities may consider zoning rules for retail stores and social clubs, or ban them outright.